How about that? Okay, it wasn't straight up chocolate...but it was good! I ate Honey Bunches of Oats Morning Energy Chocolatey Almond Crunch cereal. 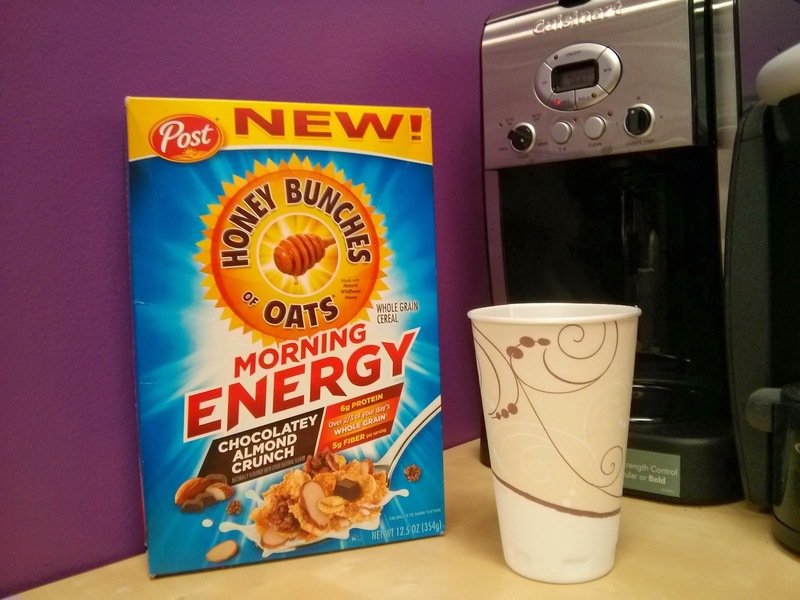 The new Honey Bunches of Oats Morning Energy cereals help get you going in the morning and keep you going all day. Packed with whole grain, protein and fiber, the combination of crispy whole grain flakes and granola clusters doesn’t sacrifice on taste to deliver a nutritious, wholesome breakfast. Available in two flavors – Cinnamon Crunch and Chocolatey Almond Crunch – these cereals are a great way to jump-start your day and help reduce mid-morning hunger. Out of the two flavors I prefer the Chocolatey Almond Crunch. They were both good, but I felt a bit indulgent when grabbing the chocolate variety and pouring it into my breakfast bowl. I feel like the Cinnamon Cruch flavor is something I have had before, while the chocolately crunch was different. While I had tried chocolate flavored cereal, the crunchieness of the granola took it to a whole new level. While we know breakfast is a very important meal (if not THE most important) good choices for a breakfast that are tasty aren't always readily available. These delicious new flavors are great and the whole grain and protein are great for an added boost to the start of your day. We've been huge fans of Honey Bunches of Oats here for a long time and it is great to add these to our shopping list! Which flavor do you think you would like best? Be sure to check out Honey Bunches of Oats on Facebook and on Twitter!